This Mazda CX-5 is definitely a compact SUV to look forward to, having an outstanding engine performance and great fuel economy on the road. Test drivers marveled at the exquisite and quite practical interior design all forged from materials of high quality. The front Row seats deliver the much needed comfort for Two adults to Fit in. The rear seats are even more spacious with ample legroom for adults as well. The moment you set your eye on this Car, it makes you fall in love. The exterior incorporates Mazda's 'Kodo Soul of Motion' exterior design that looks aggressive, muscular and elegant. 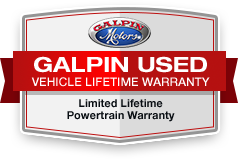 Call us today to see this attractive family hauler in person and experience 'Galpin Used Car Difference'. All figures are EPA estimates. Actual mileage will vary. Kelly Blue Book values are calculated based on the current Retail Book. Pricing analysis performed on 4/2/2019. Fuel economy calculations based on original manufacturer data for trim engine configuration.